We have created five standard processing levels for Individual and Business Financed Purchases that are grouped by promotion options and cost of sale. Step through the TABS below showing each processing level and the promotion options available for each level. The Fourth Level of Interest Free offerings that will run with super competitive Interest Free options. Go head and shoulders over your competition with 6 Months Interest Free over a 18 Month Term. 9 Months Interest Free over a 36 Month Term, plus 12 Months Interest Free over a 48 month term for business contracts. The Interest Free options available are in some cases restricted by the price of the purchase. This option will elevate you over your competition by using Retentions up to 3.4%. With Level 4 you can offer your clients a good spread of Interest Free and Deferred Start options. The Third Level of Interest Free offerings that will run with competitive Interest Free options on all terms. 3 Months Interest Free over a 6 Month Term and 9 Months Interest Free over a 48 Term Business contract are great honey pot options for your clients. The Interest Free options are all available up to the purchase price of $20,000. This option will be a good fit if your competition offer Interest Free options and you are happy to fund the cost of a clients merchant fee from a credit card purchase. With Level 3 you can offer your clients a great spread of Interest Free and Deferred Start options. The Second Level of Interest Free offerings that will run with Interest Free options on all terms. Earn up to an additional 1.5%. 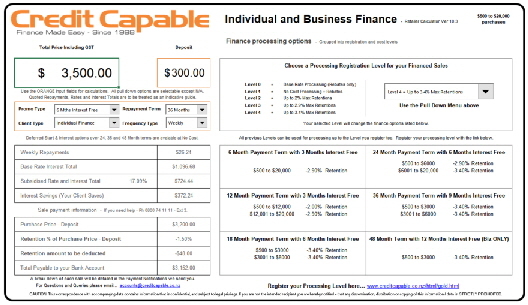 Your clients will have access to Interest Free options on all of their payment terms. The Interest Free options available are in some cases restricted by the price of the purchase. This option will be a good fit if your competition offer Interest Free options and you are happy to fund the cost of a clients merchant fee from a credit card purchase. With Level 2 you can offer your clients a good spread of Interest Free and Deferred Start options. The First Level of Interest Free offerings that will run with all but one option providing Rebates. Earn up to an additional 2.5%. Your clients will have access to four Interest Free options for their payment terms. Interest Free options are available on 18 to 48 Month Payments terms. This option will be a good fit if you run your margins and pricing to be super competitive and would not generally fund the cost of a clients merchant fee from a credit card purchase. With Level 1 you can offer your clients limited Interest Free and Deferred Start options that will run in most part earning you extra margin from each sale. Use this option to make extra margin from every financed sale you complete. Earn up to an additional 3.4%. Your clients will only have access to standard payment terms at our current Base Rate. This means they will not be able to use Interest Free or Deferred Start options that may be available from other retailers in your industry. If you sell products in a vertical market where your competition do not offer finance with promotion options and your business wishes to trial offering finance as a purchasing option, you may wish to use this processing level to get you and your staff started and familiar with using us. The Forth Level of Interest Free offerings that will run with super competitive Interest Free options. Go head a shoulders over your competition with 6 Months Interest Free over a 18 Month Term, 9 Months Interest Free over a 36 Month Term, plus 12 Months Interest Free over a 48 month term for business contracts. The Interest Free options available are in some cases restricted by the price of the purchase. This option will elevate you over your competition by using Retentions up to 3.4%. With Level 4 you can offer your clients a good spread of Interest Free and Deferred Start options. I have read and understand the Excel Retailer Calculator Ver 10.3 and are happy to have the retentions and rebates for individual and business financed sales processed from $500 - $20,000 amount financed determined by this calculator. I understand that I will be paid the total of my Invoice to Credit Capable = CC minus any deposit, minus or plus any retention or rebate shown in the calculator. CC will send payment notifications detailing the retention or rebate from each sale. CC will be able to establish a finish date of any CC interest free promotion by giving me the retailer two weeks notice. 3 Months Interest Free over a 6 Month Term and 9 Months Interest Free over a 48 Term Business contract are great honey pot options for your clients. The Interest Free options are all available up to the purchase price of $20,000. This option will be a good fit if your competition offer Interest Free options and you are happy to fund the cost of a clients merchant fee from a credit card purchase. With Level 3 you can offer your clients clients a great spread of Interest Free and Deferred Start options. The Second Level of Interest Free offerings that will run with Interest Free options on all terms. Earn up to 1.25%, depending on the term and purchased amount. With Level 2 you can offer your clients clients a good spread of Interest Free and Deferred Start options. The First Level of Interest Free offerings that will run with all but one option providing Rebates. Earn up to 2.5%, depending on the term and purchased amount. Interest Free options are available on 18 to 48 Month Payments terms. This option will be a good fit if you run your margins and pricing to be super competitive and would not generally fund the cost of a clients merchant fee from a credit card purchase. With Level 1 you can offer your clients limited Interest Free and Deferred Start options that will run in most part earning you extra margin from each sale. Use this option to make extra margin from every financed sale you complete. Earn up to 3.4% in addition, depending on the term and purchased amount. Your clients will only have access to standard payment terms at our current Base Rate. This means they will not be able to use Interest Free or Deferred Start options that may be available from other retailers in your industry. If you sell products in a vertical market where your competition do not offer finance with promotion options and your business wishes to trial offering finance as a purchasing option, you may wish to use this processing level to get you and your staff started and familiar with using us. Level and Interest Rate Registration - The % cost of a merchant fee can subsidise your clients into lower rates for their purchases. Four Interest Rate levels are available from 0%, 2%, 2.9% and 3.4% max retentions. Choose the maximum retention level to lower the interest rate you wish to use for the products you sell that will run from month to month and will be hosted in your standard landing page. I have read and understand the Excel Retailer Calculator Ver 10.2 and are happy to have the retentions for business sales processed from $500 - $40,000 amount financed determined by this calculator. I understand that I will be paid the total of my Invoice to Credit Capable = CC minus any deposit, minus any retention shown in the calculator. CC will send payment notifications detailing the retention from each sale. CC will be able to establish a finish date of any CC interest free promotion by giving me the retailer two weeks notice. Your Retailer Calculator will help you or your account check the payments from sales using finance. Payment Notification will be sent to you via email for each sale processed detailing the information of your client, invoice number, bank account number and financial details of the sale and payment. The Calculator has two TABS being a How it Works TAB and a Individual and Business TAB for calculating and marketing setup. Download Your Retailer Calculator : Click on either screen shot above or below and download to your Desktop. This TAB provides information on how to use the calculator. For checking your Payment Notifications and deciding on your Processing Level. Weekly Payments Applet for your Product Pages - Automate the break down of the purchase price into affordable weekly payments for your clients. This is a extremely effective way to deliver an alternative purchasing option into your product pages and is relatively strait forward to setup for your web developer. Our calculator will automate weekly repayments in your product pages and is a simple copy and past option for your web developer. It will automatic y update when you update your items on sale. 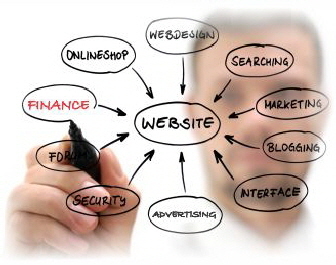 Set-up instruction is provided on a separate page for your web developer. Insert your detail below and click submit. Delivery via courier can take up to three working days to allow for production time.